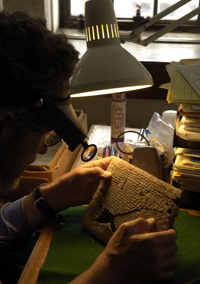 In his cramped OI office, professor Matthew Stolper examines one of the Persepolis tablets. If a group of litigants gets its way, the tablets may be split up and sold at auction, the proceeds compensating survivors of a 1997 Hamas suicide bombing in Jerusalem. Five American survivors and four family members won a 2001 U.S. court case against Iran, which trained and supported the terrorists, and were awarded more than $400 million in damages. Because Iran doesn’t accept U.S. court jurisdiction, the plaintiffs’ lawyer looked elsewhere for assets: American museums holding Iranian artifacts. While other institutions sued by the plaintiffs—including museums at the University of Michigan, Harvard, and Boston’s Museum of Fine Arts—claim that they, and not Iran, own the objects sought, Chicago’s OI has always acknowledged that its Persepolis tablets were on loan from Iran. In fact, the OI has returned about two-thirds of the original collection: 179 tablets in 1948, 37,000 tablets and fragments in 1951, and 300 tablets in 2002—when the plaintiffs’ lawyer may have read news stories about the return and decided to take the University to court. Iran had disregarded the case, filed in May 2004, until this past June, when U.S. District Judge Blanche M. Manning ruled, on appeal from a magistrate judge’s earlier ruling, that the U of C could not invoke sovereign immunity—a legal doctrine holding that governments cannot be sued—on Iran’s behalf. Iran, the judge decided, would have to claim sovereign immunity itself. The University is optimistic, he says, that “the law supports our position” that the tablets are “immune from attachment”—the legal term meaning open to seizure. The 1976 Foreign Sovereign Immunities Act, he notes, stipulates that the property in question “has to be in commercial activity,” and the Persepolis tablets, he says, are not. The federal government agrees. Although the United States has not had diplomatic relations with Iran since the 1979 hostage crisis, the State Department has twice filed statements of interest, one supporting the University’s right to assert Iran’s immunity and another supporting Chicago’s interpretation of the statute. The tablets are hardly commercial property, says OI Director Gil Stein. “These are items of cultural heritage,” Stein says, that have “never been bought or sold or used as a source of profit. They’re in a different category from the kinds of things that might be used for compensation.” Although the plaintiffs “have a wildly exaggerated idea of the cash value of these tablets,” Stein believes, the cultural and scholarly value is tremendous. “One of the best sources of information we have about the Persian Empire” because they demonstrate “the voice of the Persians themselves,” he says, the clay pieces are “comparable to the Constitution or the Magna Carta.” Their academic value increases because they were “scientifically excavated”—their origins well-documented—and because of what they reveal as a collection: “the inner workings of the Persian Empire,” Stein says, before Alexander the Great burned Persepolis around 330 BC.